It's not every day you get to witness a tornado, especially one up close since usually only storm chasers attempt that sort of thing. 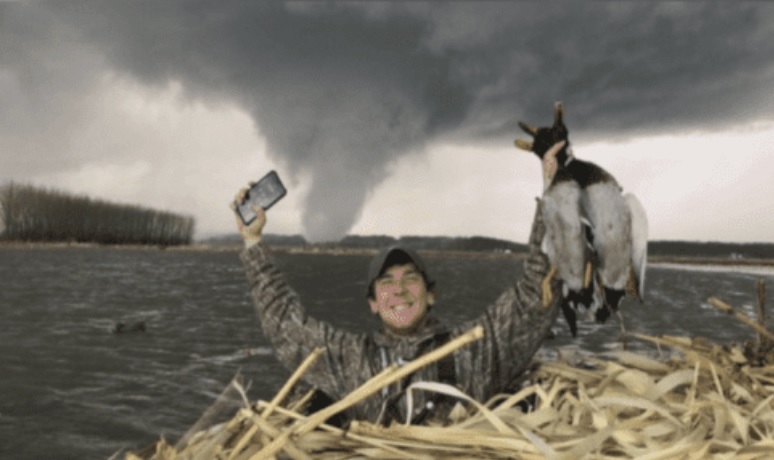 But a group of hunters in Havana, Illinois decided to ride out a tornado at the edge of a river in their duck blind. Saturday started off as a great day for the group of men who were enjoying a successful hunt in the marsh, but mother nature decided to make things a bit more interesting. Here is the video the hunters took from their duck blind during Saturday's tornado. Matt Stroub, one of the hunters in the duck blind, said, "It got real calm at first so you know you hear the calm before the storm and it actually did that, it was calm and then you know you hear the whole like it gets green out and it was kinda weird color out." The calm was actually the proverbial "calm before the storm". The other hunter in the video is Jake Meyer who said, "One particular spot was very angry, it was moving every direction and naturally that’s where it ended up dropping out." Another witness to the tornado named Jace Pedigo said, "It sounded like the mix between a freight train and the biggest wooden turbine." By the time the hunters realized how serious the storm was, they decided their best bet was to just stay put. Another hunter in the group named Levi Sarff said, "We were in a steel pit, inside the ground, we would have had to walk through water to the four-wheeler to get back to the trucks, and our trucks were actually in the path of where the tornado was going." Sitting in their makeshift duck stand, the hunters had nothing else to do but wait out the storm and film it with their cell phones. It is a good thing they did because otherwise, some people may have found their story a little too hard to believe. Sarff added, "That’s when I told Jace to hold up the ducks and tried to snap a few pictures and never in a million years that we were gonna get the picture that we did." The tornado seemed to be headed straight for the group as they hunkered down in their duck blind, but at the last minute, it veered to the side of where they were positioned. Thankfully, they were safe and as a bonus, they got a front row seat to one of mother nature's great shows and a story to tell their friends. "The tornado actually destroyed a shed and a few grain bins just two fields away from us, so we knew it was definitely serious," Sarff said. The group says they won't ever forget seeing the enormous strength of the tornado up close and personal. "The force of it and you know the sheer power of it, it was an incredible, incredible thing to see," Stroub said. Jace Pedigo added, "Makes you feel pretty alive and glad to feel alive."